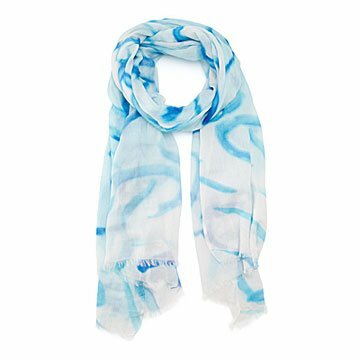 Wear a work of art based on a child's oceanic finger painting and help support charities. Sophisticated color palette. Matisse-like brush strokes. Would you believe us if we told you this scarf is based on a little kid's finger painting? Fashion industry veteran Debbie Martin works with children with disabilities, including her niece, Hazel, to transform their original designs into wearable works of art. Cue this lovely design. Inspired by the ocean's rippling waves, the lightweight scarf brings bright hues to your spring or summer outfit. And to top off the heartwarming story behind the design, a percentage of the proceeds are donated to children's charities and genetic research. Made in India.